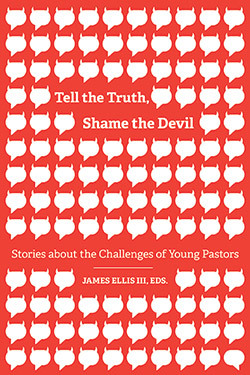 James Ellis III is an ordained Baptist pastor and writer based in Holland, Michigan. Presently pursuing the Doctor of Ministry degree at Asbury Theological Seminary, he is a graduate of Pittsburgh Theological Seminary, George W. Truett Theological Seminary at Baylor University, and the University of Maryland. He and his wife love bowling together, even though they aren’t good at it. What were you hoping to achieve with Tell the Truth, Shame the Devil? From my vantage point, at times Christians play dodgeball with the truth. They avoid it at all costs for fear of reprisal or being misunderstood. I have known many pastors as well who have become world-class actors, pretending that everything is hunky-dory while they suffer in silence. You don’t have to yell in order to tell the truth, nor must you be bitter or seething with malice, but perpetually turning one’s frown upside-down in the name of unity isn’t healthy or godly. Before sharing what would be a sobering comment, Jesus often said, “I tell you the truth.” The truth is that the complexities of the pastoral vocation are uniquely challenging, so instead of safely dancing around the issue, I hope that this book will help give all Christians, but pastors especially, permission to speak the truth in love because therein lies freedom.